Mustard Seed Hill has sought to restore the historic Millersburg Military Institute property to its former glory, while honoring the rich tradition and legacy. Even before it’s past as the home of the military institute, the Millersburg community was home to another institution of Kentucky education. Kentucky Wesleyan College was founded in 1858 by the Kentucky Conference of the Methodist Episcopal Church. While its campus has since relocated to Kentucky’s fourth largest city – Owensboro, the school originally opened its doors in 1866 in Millersburg, KY. What began as a training school for preachers quickly expanded with additional business and liberal arts curriculum being added. In 1890 the school was moved to Winchester and soon after women began to be admitted for the first time. In 1951, the school moved to its present location in Owensboro. 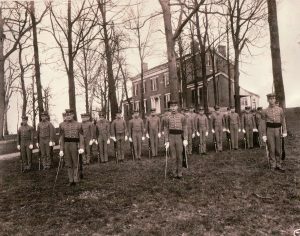 Building on its education roots, shortly after Kentucky Wesleyan moved to Winchester, the Millersburg Military Institute ( or “MMI”) was a military boarding school founded in 1893. The school was founded by Colonel C.M. Best, who purchased the land from the Kentucky Methodist Conference and converted the building into a military boarding school. In 1898, the first class of 17 students graduated from the school. By 1903, MMI’s growth had prompted the construction of additional buildings, but the school would soon face yet another turning point. added other facilities to the campus, including a classroom building, a gymnaisum, and a chapel. Upwards of 250 students were enrolled during the school’s peak operating times; however, class sizes steadily declined through the early 2000’s. In 2003, Millersburg Military Institute was renamed the Millersburg Military Academy and operated as a military boarding school until 2006. In 2008, the property was purchased by the U.S. Army Cadet Corps, and converted into its national headquarters, as well as a National Cadet Training Center. The facility served again as a military boarding school as Forest Hill Military Academy starting in August 2012. In 2014, the US Army Cadet Corps began a reorganization and closed the school. 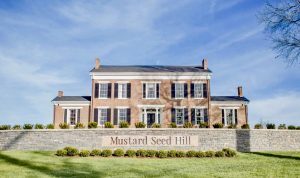 Community Ventures, a Kentucky non-profit organization, purchased the campus in 2016 and the campus took on the name Mustard Seed Hill, symbolizing how a small amount of faith can flourish into something great.. For the Millersburg community, the campus continues to represents history, pride, and opportunity, hearkening back to a time when this community and school supported one another, a time when a thriving MMI meant job oppotunities and valuable investment into the greater town of Millersburg, and a time when its citizens watched as generations of young students achieved greatness before their very eyes. The Community Ventures mission at Mustard Seed Hill is focused on driving visitors to Millersburg through events, weddings, corporate retreats, family reunions and athletics. Bourbon Christian Academy also resides on the campus and provides additional entrepreneurship and momentum for growth.